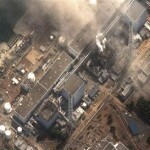 The No.3 nuclear reactor of the Fukushima Daiichi nuclear plant at Minamisoma is seen burning after a blast following an earthquake and tsunami in this handout satellite image taken March 14, 2011. Several sources have said that there was radioactive material released into the atmosphere, but they differ on just how much. They also differ on the severity of the disaster. Some say best case like Three Mile Island, worst case Chernobyl. Tokyo is less than 200 miles south of the plant and they afraid of radiation – levels spiked to 10 times normal a few days after the earthquake. 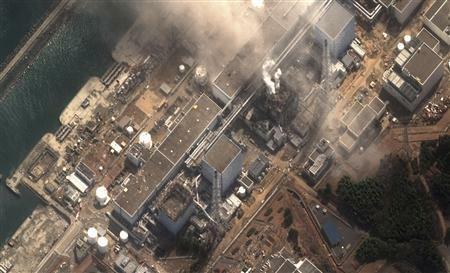 A week after the earthquake and they are still fighting fires, trying to prevent total core meltdown to at least 3 of the 6 reactors at Daiichi, and trying to limit radiation release/exposure. The whole world has rushed to Japan’s aid. This entry was posted in Nature and tagged earthquake, Japan, nuclear power, tidal wave by Chris Siems. Bookmark the permalink.